Melton, a vast satellite suburb 36 km north-west of Melbourne, quadrupled its population from 4491 in 1971 to 18,055 in 1981, and has continued to grow rapidly since, spawning suburbs of its own. Founded as a tiny settlement on the road to the Ballarat gold fields, it gained some prominence when the railway line to Ballarat was finally built in the 1880s, and trains still use the spectacular steel girder railway bridge over the Werribee River. Melton’s landscape is dominated by new brick housing, some of which could be characterised as McMansions. Melton is a residential township 36 km north-west of central Melbourne on the Western Highway to Ballarat. It was characterised as a satellite town during the 1970s, and to some extent was still that in the 2010s, as Rockbank to its east was sparsely settled in a residential sense. Melton is on undulating basaltic and alluvial plains, dissected by the Toolern and other creeks which enter the Werribee River to the south of the township. Eastwards are two basaltic cones, Mounts Cottrell and Kororoit. The name came from Melton Mowbray, England, a place famous for hunting and coursing. Several settlers ran hounds on their properties, which were also venues for hunt clubs. Two settlers stand out in Melton's history. Thomas Pyke took up a run in 1839, extending from Pykes Creek (west of Bacchus Marsh) to Melton. It was his hunt which inspired the name for Melton. A more enduring settler was Simon Staughton, beginning his career near the junction of Toolern Creek and Werribee River in 1846. His Exford estate comprised 28,400 ha to the south of the township by 1860, and the Exford homestead is on the Victorian Heritage Register. Simon’s son, Samuel Staughton, became a shire councillor, and the family farmed the estate until most of it was broken up for closer settlement in the early 1900s. Three of the four magistrates in the district were Staughtons in 1880. 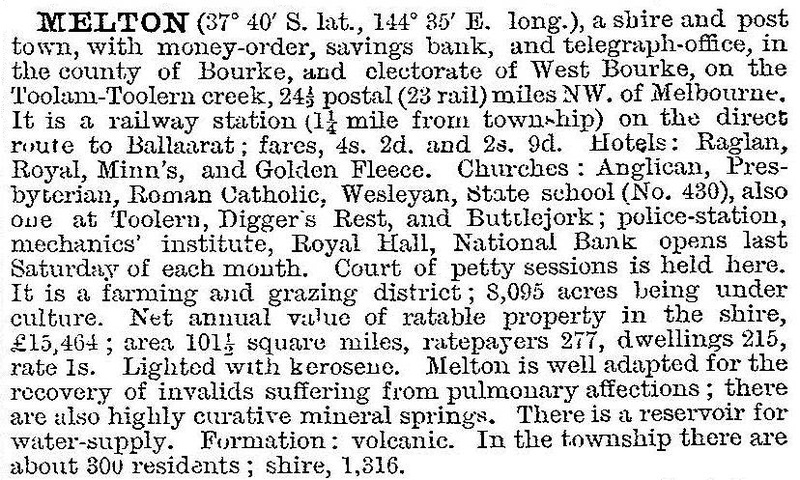 Melton settled into a rural existence until the 1960s.The town and immediate district had about 300 people. The town's commerce actually declined, from four hotels in 1900 to two by the 1930s, and from two sawmills to one. Other facilities were a mechanics' institute, recreation reserves, sale yards and a sheep dip. The town's population quadrupled between 1966 and 1971. The State Government identified Melton as one of two locations west of Melbourne that could absorb urban growth that otherwise would go to the over-sized eastern suburbs. 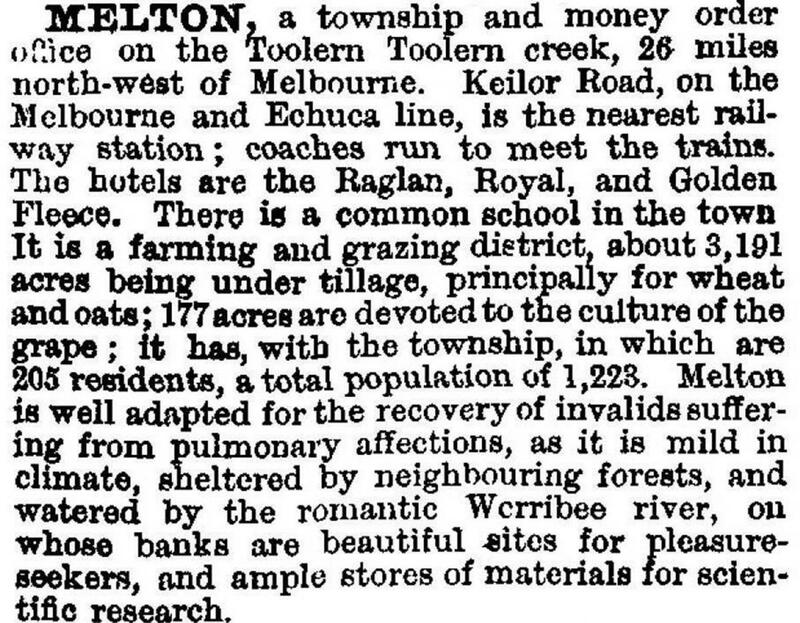 By then Melton township had a population of about 4000, and Melton South, around the railway station, had developed. Its primary school (1911), chaff mills, silo and railway siding were enlivened with a public hall and houses. By 1981 Melton and Melton South had blended into one, with a population of over 18,000. The Melton high school and a Regional Catholic College opened in 1975 and 1980, along with a technical school (1979) in Melton South. A Catholic primary school opened in 1976. Arnold's Creek Primary School opened in Melton in 2015. Melton's shopping area on the Western Highway was challenged by a drive-in facility about 1 km westwards in 1973. The traditional centre has prospered, however, perhaps through having the hotels, post office, a market, library and nearby council offices. The drive-in centre with 10,800 sq metres (supermarket and 32 shops), was the smaller of the two. By 2012 it was 22,500 sq metres. Having gone southwards in the 1970s, Melton expanded northwards in the next decade, creating Kurunjang. The shopping centre also grew in that direction, losing much of the highway's through traffic to the Western Freeway. A large industrial park was formed east of the township. Across the Western Freeway from the industrial estate there is the Tabcorp Park racecourse (2009). The watercourses flowing through Melton have provided space for linear parks. The largest series of spaces is along the Toolern Creek, including a golf club, a reserve with sporting facilities and an historic homestead, The Willows (1855). A tributary, Ryans Creek, has a linear park and the Melton botanic garden. By the mid-2000s, Melton had four adjacent suburbs, Kurunjang, Melton South, Brookfield and Melton West. The railway station in Melton South was provided with a large commuter car-park, but Melton is a car-dependent community. The train service is provided by V Link to the Metro service at Sunshine.